Harry Potter author JK Rowling has congratulated the team of Quidditch players which won the championship of the sport she created. 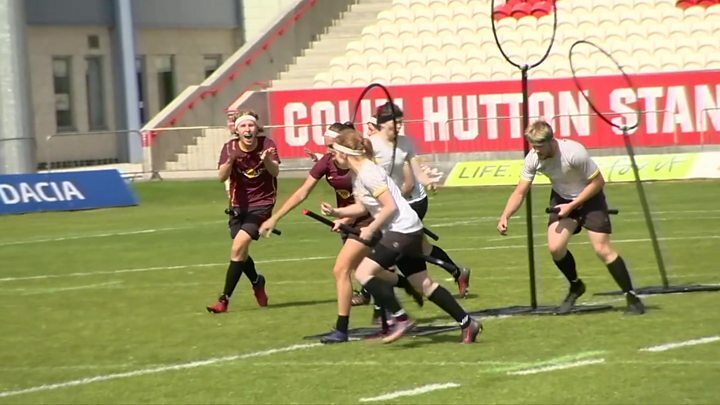 The novelist tweeted that she saw the West Midlands Revolution team win the first Quidditch Premier League Championship in Hull. The team beat the South East Knights in the final at the championship. Harry Potter's favourite sport involves seven players on the pitch, each with a "broom" between their legs. Jen McCallum, of the winning team, told the BBC: "I'm quite a Harry Potter fan. I have a broom mounted on my wall and several others. "But that doesn't detract from the fact that I do this for a sport." Other players said team work, determination and enthusiasm were essential attributes for the sport. A team of seven will have one keeper, three chasers, two beaters and one seeker. Video Fancy a game of Quidditch?